Constant transaction coding and repetitive data entry were time consuming, and doing it manually offered little, if any, control. 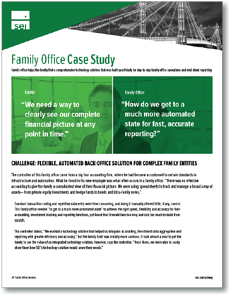 This family office needed “to get to a much more automated state” to achieve the right speed, flexibility and accuracy for their accounting, investment tracking and reporting functions. So what did they do? Read our Family Office Case Study to learn how SEI Archway's family office solutions helped one firm revolutionize its accounting, investment management and reporting processes.